I was the 35th President of the United States. I am John F. Kennedy. When I was young, people called me courageous and competitive. I used those qualities to serve as a commander in the U.S. Navy. The leadership skills I learned in combat helped earn me a place first as a congressman in the U.S. House of Representatives, and later as a U.S. senator-but that was just the beginning. I became another kind of commander, the commander in chief of the U.S. armed forces, when I was elected president. I was the youngest man to ever hold the office. and my youth affected the progressive decisions I made and the laws I passed. Though I accomplished a great deal in my short life, I was assassinated at the age of forty-six. Still, my brave choices changed the lives of generations to come. I am John F. Kennedy. 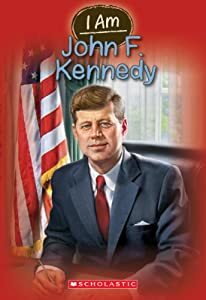 Featuring full-color illustrated covers, beautiful interior illustrations, a detailed timeline, introductions to other notable people from the story, and simple maps, I Am John F. Kennedy is more than your average biography. This was an insightful book into our 35th President. My daughter was excited to read this because for some reason she has always been intrigued by this President. I don't know if it was the fact that he pushed the Mission to the Moon or what but she always has been. With that being said the book itself was intriguing and easy to read (we actually read this in one day). I was also impressed with how easy this was for my 3rd grade daughter to read. The book was filled with facts that I was not aware of as I had not yet read a biography about this President. I enjoyed this completely and so did my daughter - you will too!